THE Litunga of Western Province has backed President Edgar Lungu’s stance that the issue of the Barotseland Agreement of 1964 should be left to the Government and the Barotse Royal Establishment (BRE) to deal with. 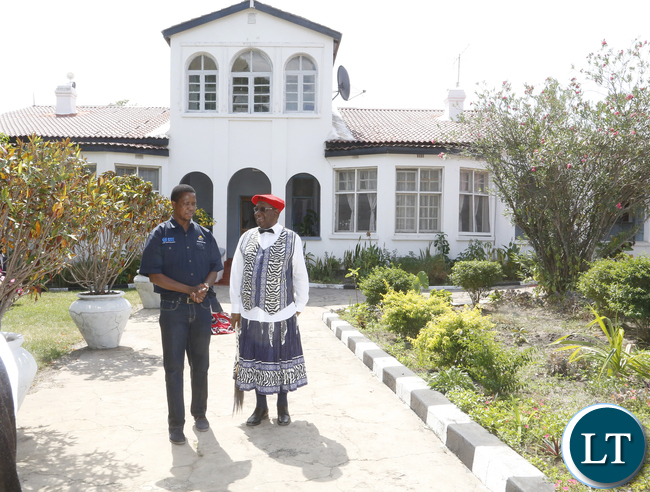 President Lungu, who is in Mongu on a two-day visit to check on various development programmes, held a private meeting with the Litunga at his palace in Limulunga yesterday, where the matter of the Barotseland Agreement was raised. According to State House Special Assistant for Press and Public Relations Amos Chanda, the Litunga advised that all other splinter groups concerning the issue should stay away from further debates and allow the BRE and Government to resolve it. Mr Chanda said the talks were fruitful, with the Litunga thanking President Lungu for visiting, especially to check on the progress of various development projects being implemented in the province. 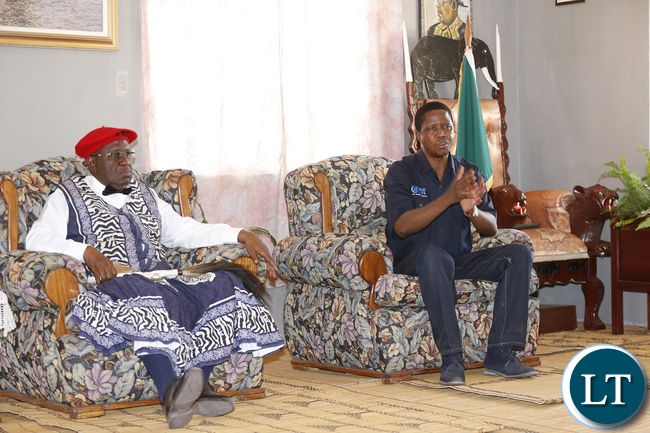 “His Majesty the Litunga has thanked the President for visiting his palace and thanked him for a number of projects, including the Mongu-Kalabo Road and Sioma Bridge projects,” Mr Chanda said. He said in an interview after the meeting that President Lungu was committed to the existence of the agreement, but that the modalities on how to settle the matter should be left to the Government and the BRE, hence the talks to find an amicable end to the long-standing debate. Earlier in the morning when the President arrived in Mongu, he said those who wanted to suppress the authority of the Government and the Litunga had no room to do so because the country needed to continue existing in harmony. Mr Lungu said the Barotseland Agreement was a sensitive issue and, as such, there was a channel that required to be followed to address it. “Today (yesterday), I want to say something about an issue that has been burning for the past years, which is the Barotseland Agreement. “The last time I spoke about the issue was in 2015 at a regional meeting in Addis Ababa, Ethiopia, but as from that time, I deliberately kept quiet, but I have been engaging with some people from Western Province,” he said. He said he and the Litunga were now entitled to take responsibility over the matter. “So whoever wants to talk to me over the issue can come through the Litunga and the BRE. 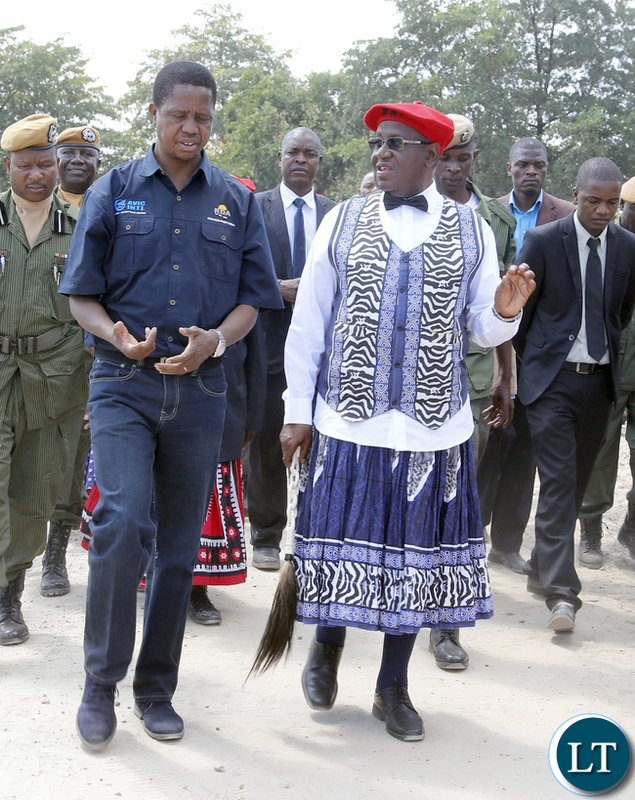 Most of you have issues to raise on the matter, bring them through the BRE and the Litunga,” President Lungu said. Provincial Minister Poniso Njeulu said the people of Western Province were happy with President Lungu’s leadership, especially considering the immense development taking place in the area. The President’s entourage included Defence Minister Richwell Siamunene, Works and Supply Minister Yamfwa Mukanga, Local Government Minister Emerine Kabanshi, Higher Education Minister Michael Kaingu and other senior Government officials. So some people will call the Litunga names for agreeing with ECL on the Barotse issue,watch this space. Lousy Lozi hospitality from the Litunga. No Jameson for the host. EL really looks out-going president ZWD is right. No solutions but only passing the back so that the BRE should be at the receiving end. So Amos Chanda is now The Litunga‘s spokesperson and the Ngambela? Nice try but you could only f0ol manyukunyuku and non Lozis with that one. Let me school you how the governance of my people operates. The Litunga speaks through the ‘Kuta’ or the decision making organ comprising of the Indunas. He never makes unilateral declarations as sensitive as BA’64. The BRE’s spokesman is The Ngambela (Prime minister)… he can also speak for the Litunga, but can’t make unilateral decisions either. Ultimately The People have a final say and the Litunga is only a symbol. So Lungu and Chanda are kidding themselves on this one. Nice try but it failed lamentably. Dear Malozi, when you have a kaBemba (mucahabeli) like Amos Chanda fawning and scraping the ground calling the Litunga, His Majesty, you know something is seriously wrong. You are being conned, being mugged. Lungu is up to no good. That is the language of kaponyas as they relieve you of your wallet (amaBosses, bakalamba, bacikulile). Bo ndate your sofa nipa chibululu navovala? Do you Lozis drink beer? What is your local katata or katibi? I ask because everyone looks so innocent and bitter. This issue will be sorted out by introducing strong provincial governments with a small and less power laden central government when UPND forms government. This will enable both the sharing of the national cake and sharing of corruption benefits done at provincial level unlike the current arrangement where everything in the nation (national cake and corruption benefits) is shared by a small clique at central government apex. Western Province, all these are our people. Barotse is a non starter in 21st century Zambia. It’s just Wainyela Sinyinda and a few corrupt elements trying to raise dust because they’ve outlived their usefulness. The Litunga is a wise man who knows that Zambia is one Zambia. No Barotse talk holds any water when we have partnered with our brothers and sisters from Western Province, who for years cried for an equal share of the national cake. They asked for development and we have delivered. Kudos. Malozi are not anybody’s people, especially a corrupt thieving Bemba govt. So why is your president so worked off over it do much as to lie about it? He’s now forcing issues by turning Chanda into a Ngambela and Litunga spokesman. For your info, the genesis of ‘One Zambia One Nation’ is Barotseland Agreement of 1964. Without it the two countries cease to exist as a unitary state of Zambia. So stop contradicting yourself. Speaking of 21st century, civilization dictates a people have a right to choose their own destiny like the recent referendum in Scotland and the current debate on UK leaving the EU… you don’t muzzle people, subjugate and force them to be part of a union that has no benefits and which union was abrogated unilaterally by one party. This is a pointless non starter topic. Zambia can never give in to a split as per the mischievous colonial arranged pac. English left a mess in Africa by setting Africans against the other in the way they divided borders in a senseless way that would ensure they fight each other. Look at Rwanda, the Tribes fought, killed each other and then………..now live in Tribal harmony after the cost of bloodletting that went on. It makes no sense to entertain this madness. The logicality of giving the bigger part of Zambia, our Tourist hotspot Livingston to a crazy bunch of Tribe will never happen. It’s economically a madness, it can not work. Politically, it’s a War warning. @ Patriot Abroad… you are contradicting yourself. read your comment again. You are preaching peace and war in the same breathe; calling another ‘tribe’ crazy, acknowledging the ‘mess’ left by the English while also insisting and clinging to the same ‘borders’ mess left by the same English. If you were fair minded you would acknowledge that without the same ‘English borders mess’ we wouldn’t have Zambia today. Musi-oa-Tunya would remain under different tribal borders. Speaking of borders, yes they were always there, except the borders we had back then were under tribal boundaries and influences, hence the Barotseland borders of those days. Thankyou Mr. Outgoing president at least you are being useful for a change, Good Stead for incoming president of the republic of Zambia; President HH. i fail to see how primitive one is by simply stating ‘outgoing’ and i think you meant to say hatred. Somebody with a higher reasoning ability won’t see any hate in what i posted, now judging from your post it would be a complete waste of time to engage into a conversation with you coz clearly we not on the same wavelength. I think we have a human being in state house. Isn’t this refreshing after decades of living with presidents who presented themselves as small gods? And ECL listens too. Makes me resolve not to allow the types of GBM anywhere near instruments of power. Si Barotse yanyoko says Lungu, so shut up and let me do my things. Meanwhile boLitunga ikataniko iyi k3m libeshi! Litunga is corrupt what are they talking in secrecy the two of them.Just thinking “we shall adopt Inonge as running mate”ba munama Litunga nayeve avelela.lol lozis are dull. The Lozi people will not be conned again. The approach by President Lungu and the Litunga is not correct. This is not a matter to be resolved by the BRE and Government. This is a matter to be resolved by the Lozi people, with the BRE as facilitator of the process. The Government of the Republic of Zambia will be involved, the International legal system will also be involved. The problem was caused by Dr. Kaunda’s attempts to manipulate things. Manipulation has short legs. Honesty and integrity is the key in all important matters. The bitterness of UPND supporters knows no bounds to the extent that they criticise how ECL is sitting! Ma heart attack yaza paka maningi mu August. So who is govt…and what stage have these discussions on? When it comes to commissioning projects its on the name of PF govt…anyway Lungu is too dull to discuss such delicate matters!! It is no secret that Western Province has been secluded from national development. Mongu- Kalabo stretch is not a victory, it is just a starting point. You have a point. Historically, however, the schism over this issue, has been between the Litunga and the Zambian government; KK himself being the first one to jump out of the frying pan by abrogating the Agreement in 1969. The current Litunga is a passer-by, an extremist, who appears to wink at the whole issue. As far as he is concerned, it’s a non-issue. Much as the stance of the current Litunga may be appreciated, for peace’s sake, it fails miserably to both re-write and/or eclipse history. The precedence this current Litunga sets cannot be said to over-ride those of his predecessors. it’s the reason, his standing in Barotseland, is largely despised and vehemently abhorred. At best, he is perceived as a traitor. In consequence, the Barotse people, through the Ngambela and the BNC, usurped the current Litunga’s legitimacy to be their official spokesperson. Seen from this perspective, both President Lungu and the current Litunga of Barotseland are illegitimate representatives of their respective governments. Whatever deal they have made, is a sham. This present Litunga wants the whole world to believe that he is the official voice of the Barotse people. Onlookers must, however, be intrigued by the fact that, ever since the Ngambela resigned, nearly a decade ago, he, the Litunga, has not been able to order his replacement. On the contrary, the Barotse people still continue to rally behind Ngambela Wainyae Sinyinda, still according him the recognition, as their leader. That’s unprecedented in as far as the history of the Ngambelas in Barotseland is concerned. Tradition behind him, the Litunga, is here supposed to exhibit his power. He has none. The BRE, itself, a creation of Kaunda’s, can only be seen as a weed, planted with a sinister motive to choke life out of the true plant; functioning as an agent of the Zambian government. How many tribes are in western province and how big are they? Stanley, Dream maker be ready for the tears. a traitor is holding the Litungaship. it is a living testimony of Kafupi’s political engineering. now this makes sad reading beacause according to Lozi custom the litunga cant impose a decision on his people. he has just put hot on his head. time will tell. We concur and as hard working development oriented leader, another term awaits you SIR. The Barotseland Issue is beyond the Litunga and the Zambian Government. The Zambian Government resigned from the deal in 1969. As for the Litunga, he lacks the power to hold the Barotse people hostage. What is tenable is that, the Barotse people themselves, through the Barotse National Council (BNC), determine their own destiny. Thus said, the empty claim being made here by both president Lungu and the Litunga, is a nullity. Let him together with the BRE address and resolve the issue with the Barotse people through the BNC. Otherwise, in Barotseland’s hierarchy, where, in this setting, is the Ngambela and the BNC relative to the Litunga and the BRE? These Kanchemas will die of envy for ECL ? They thought Western province was theirs but they are shocked.Hence the ridiculous comments……u will cry the loudest because PF is winning the next elections. MD..analyze your POST it’s the one that fits ridiculous…provocative language. “He said he and Litunga were now mandated to take responsibility over the matter.” So it’s true: it doesn’t need a degree for anyone to be an *****! Who mandated them? Since when did the stupid and treacherous Imwiko have powers to override the Barotse conferred upon him? The Malozi, through the BNC, speak for themselves. And why are these self-annointed Zambia so eager to have Barotseland as part of Zambia when they withdrew from the union long ago? They shouldn’t think artificial slogans like’One Zambia One Nation’ shall ever work! Fa kona fobaka bonela kuli Mulozi is unstoppable when he has made a resolution and decided in a particular direction! Kinako bana ba Poho Yensu! We wait for the official statement from the Kuta. Does it exist anyway? The Litunga has his mouth full. He has eaten from humble ECL’s table. What makes the Lozi guys think the Kuta has not eaten too? All you need are strong governance rules which are not enshrined in one human being. HH shamed again here by the Litunga! !HH’s desperation for state house has made him to promise Lozis that he will divide united Zambia so that Lozis can vote for him-shame! !WE NEED A UNITED ZAMBIA TO CONTINUE! !SO BRAVO TO EDGAR LUNGU AND THE LITUNGA! !INDEED “IFINTU NI LUNGU-2016! !”GO PF GO!! Seeing leaders together, discussing objectively the best way to resolve problems of the land is very encouraging. The purpose of leadership is to represent people and resolve issues in the interest of the people. This is good to see. Zambia is bigger than all of us. Long live Zambia.